Please read the entire hike description and answer the question to sign up for the hike. Due to the difficulty level, sign up is through the wait list only. THIS ROUTE HAS A PERMANENT, FIXED ROPE. Not for beginners or those afraid of heights. Helmets are always welcome. Be sure to use one that doesn't block your sight. Always carry "in case of emergency" numbers with you. Red Cap is a peak in the Calico Hills. From there you get a great view of the City and the Park. The ascent is almost entirely scrambling with quick elevation gain. Along the way there are lots of different types of rocks to see and maybe some wildlife. A year ago this month is the last time we completed this particular route and we finished with more people than we started with. Lana found us just above the rope and accompanied us back to the trailhead...and the rest is history! This week we'll be doing the same route with Lana starting out with us. We'll start at the Kraft Trailhead and climb to the top. It's about 3.5 miles hike with significant elevation to get the heart pounding. We'll have several options to take, so the exact route will be decided the day of the event. However, we'll pretty much stick to the Double Alternate Route as the descent, with perhaps a quick diversion or two. Bring plenty of water and snacks for the peak - it's going to be toasty out there! When we return to the parking lot we'll be celebrating another momentous occasion - Michael has 150 hikes! Sign up for the hike or let me know you are coming out for cantina (and bring something yummy to munch). This Class 3 route has some Class 4 spots. We have seen some wildlife in this area: chipmunks, cottontails and chuckwallas mostly. We'll keep an eye out for them. It's always special to see some wildlife. There are some places that require advanced scrambling skills and there is some exposure. You must be able to pull your body weight up and lower yourself down using your arms. If I don't know you or if I can't determine your scrambling experience from your profile, then send me an email detailing your scrambling experience. Details means a description of the climbing you've done and the people you did it with. No guests will be allowed without my prior approval. YOU MUST BE ON THE "GOING" LIST IN ORDER TO GO ON THIS HIKE. CRASHING WILL NOT BE ALLOWED. We'll meet at the Kraft Mountain Trailhead in Calico Basin. Go past Red Springs Picnic area and follow the pavement to the end. Frequently asked questions. (http://www.meetup.com/VegasHikers/pages/Frequently_Asked_Questions/) Distance: ~ 3.0 mile loop. Elevation gain: ~ 800 ft. High point: 4930 Low point: 4300 Difficulty: moderate - difficult (Class 3-4 scrambling, elevation gain) Pace: ~ 2 Miles Per Hour. Children: no. Dogs: no. Time: ~3.5 hours. Bring: At least two liters of water. Snacks. Please note the following: • Meetup organizers are not tour guides and are not park rangers. Expect the same risks and take the same precautions you would take if you were hiking alone. You are solely responsible for your own safety and well-being. 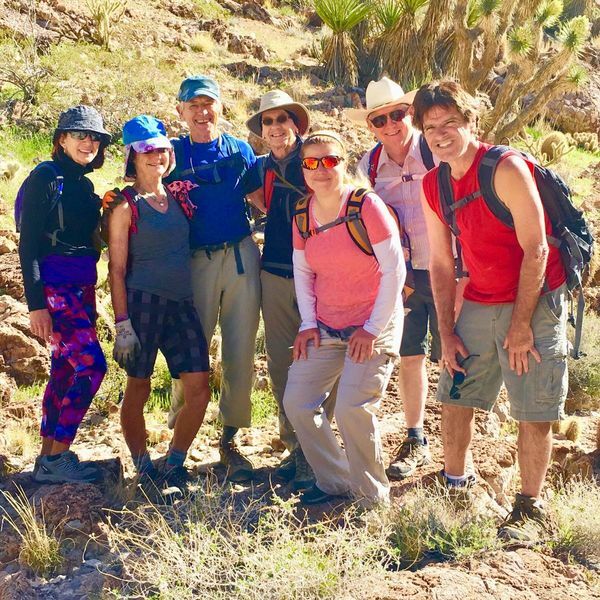 • By signing up for and/or attending this Meetup event, you acknowledge, understand, accept, and agree that hiking and other outdoor activities can be dangerous and can cause serious bodily injury and possibly death. The organizers of this group and current and former members cannot be held responsible or liable in any way for the actions of any participant - including you - at any event. • All attendees participate at an event at their own risk and are solely responsible for any damage to their property, and/or any injury to themselves or their guests. • By signing up for and/or attending this Meetup event, you affirm that you understand this disclaimer, and that you knowingly and voluntarily agree not to bring any type of claim arising out of or related to this Meetup event against the organizers of this Meetup group. PLEASE, participants must read the entire description and the waiver and ANSWER THE QUESTION AT THE END, it's after the waiver. Everyone starts on the wait list. Maximum is about 10. Very experienced scrambling friends are welcome to come. GRAND STAIRCASE Beginner's scramble - read the entire description. DISTANCE: 1-1.5 miles up a mountain. DIFFICULTY 3 - 3.3 of 5 EXPOSURE: A little ELEVATION GAIN: 800 vertical feet +- SPEED about 2 of 5 -- it's strenuous if you aren't used to climbing. KIDS AND DOGS NO, and NO GUESTS: NO Meetup is free to join, only members allowed. RESTROOMS: Only at the picnic area FEAR OF HEIGHTS??? DON'T sign up. SERIOUS HEALTH ISSUES???? DON'T SIGN UP. Elevation gain and very strenuous for those not in good Cardio-shape. It's a fairly slow scramble up the mountain on a route that provides a few challenges in climbing for new scramblers, but mostly it's intended for people very new to scrambling who haven't yet been on an event with much elevation gain or speed. Maximum 6 BEGINNERS with very little experience scrambling. Total group size of beginners, experienced beginners is 10. VERY EXPERIENCED scrambling friends and organizers are welcome to come, without limit. Other Organizers and very experienced scrambling/hiking friends are invited to show up to meet the new scramblers and help. This will be an interval training pace, fast bits, then slower, to build some stamina. The intent is to come down by a different route, but we will see how quickly we can climb the mountain. Participants must be fit enough to walk a mile in 15 minutes or less on flat ground. Everyone starts on the waitlist. Answer the question at the very end. Everyone must have some skill and experience, like my beginner skills, or low n slow events or some other scrambling experience, recent, that I can verify. A backpack and water are essential, your hands must be free for climbing. I have some loaners. Flexible clothing, and closed shoes that stick to the rock are necessary. GENERAL HIKE/SCRAMBLE ETIQUETTE: If you signed up, show up, on time, ready to go by the start time. Be prepared, shoes on, pack on, water enough for the event. Plan to arrive ten minutes early, we aren't waiting for you, it's your responsibility to find the starting location and be there. This applies to any event at all, not just mine. Please note the following: • Meetup organizers are not tour guides and are not park rangers. Expect the same risks and take the same precautions you would take if you were hiking alone. You are solely responsible for your own safety and well-being. • By signing up for and/or attending this Meetup event, you acknowledge, understand, accept, and agree that hiking and other outdoor activities can be dangerous and can cause serious bodily injury and possibly death. The organizers of this group and current and former members cannot be held responsible or liable in any way for the actions of any participant - including you - at any event. • All attendees participate at an event at their own risk and are solely responsible for any damage to their property, and/or any injury to themselves or their guests. • By signing up for and/or attending this Meetup event, you affirm that you understand this disclaimer, and that you knowingly and voluntarily agree not to bring any type of claim arising out of or related to this Meetup event against the organizers of this Meetup group. There are numerous routes up Ash Canyon. The route we will be taking includes some class 3 scrambling and boulders. There's a small valley between the top of the canyon and the trail now known as "rattlesnake." From there it's a hike down the wash, up the trail to the top of Hell Hill and down to our starting point. This isn't a beginner's hike; you absolutely must have experience doing hikes that include intermediate level scrambling. We'll be starting out at the Kraft Mt. trail head. From there we'll head up the canyon. To get to the trail head take West Charleston out to the Calico Basin turnoff and follow the paved road, past the Red Springs parking area, all the way to the end of the road. Distance: ~ 3 mile loop Elevation gain: ~ 1,300 ft. High point: 4,530 Low point: 3,700 Difficulty: moderate Pace: ~ moderate Children: no Dogs: only dogs that have done rock scrambling hikes Time: approximately 2 hours Bring at least two liters of water (a hydration system is recommended since you will need to use your hands to pull yourself up) and a headlamp or small flashlight. Please note the following: • Please be aware that your Meetup organizers are not tour guides and are not park rangers. • Expect the same risks and take the same precautions you would take if you were hiking alone. You are solely responsible for your own safety and well-being. • By signing up for and/or attending this Meetup event, you acknowledge, understand, accept, and agree that hiking and other outdoor activities can be dangerous and can cause serious bodily injury and possibly death. The organizers of this group and current and former members can not be held responsible or liable in any way for the actions of any participant - including you - at any event. • All attendees participate at an event at their own risk and are solely responsible for any damage to their property, and/or any injury to themselves or their guests. • By signing up for and/or attending this Meetup event, you affirm that you understand this disclaimer, and that you knowingly and voluntarily agree not to bring any type of claim arising out of or related to this Meetup event against the organizers of this Meetup group. Rappelling with Richard! Calico Express! REQUIREMENTS FOR SIGN UP • You must have done one of my Tier 2 or higher hikes or be able to describe your scrambling experience (places and people). I’m not interested in the trail hikes you’ve done. • You must read the entire hike description (including the waiver) and indicate that you read it by answering the question that pops up when signing up for the hike. BRING A FLASHLIGHT OR HEADLAMP IN CASE WE STAY OUT TOO LONG. There's a large sandy area in the heart of the Calico Hills. It's flat and guarded by rocks from all sides. Many routes pass right through it. Except for the footprints and the red color, it can look like the moon. On this hike we'll take a different path up to it and then return through some well-known trails. For this route there are many obstacles to challenge you. The climb up will get your heart pumping. You'll squeeze through a crack in the rocks and climb up a vertical slab along with many other obstacles. There are lots of rock formations to see and admire on this route. I've seen tortoises and roadrunners and chuckwallas along this route, so we'll be keeping an eye out for any of them and other animals. Check out my wildlife gallery for some of my favorite pictures of animals I've seen. This hike is not for beginners. There are many places that require intermediate scrambling skills. You must be able to pull your body weight up and lower yourself down using your arms. If you have a fear of tight spaces or heights, don't sign up for this hike. • Helmets are always welcome. Be sure to use one that doesn't block your sight. • Always carry "in case of emergency" numbers with you. • No guests will be allowed without my prior approval. YOU MUST BE ON THE "GOING" LIST IN ORDER TO GO ON THIS HIKE. CRASHING WILL NOT BE ALLOWED. Meet location will be sent on by message or text on the night before the hike. STATS • Distance: ~ 2.5 miles loop. • Elevation gain: ~ 900 ft. • High point: 4450 • Low point: 3600 • Difficulty: moderate • Pace: ~ 1 Miles Per Hour • Children: no. • Dogs: no. • Time: 3 hours max. • Bring: At least two liters of water. Snacks INFORMATIONAL LINKS Scrambling Tiers https://www.dropbox.com/s/7og9dz3n8yey9m7/rickw%20scrambling%20tiers-colors.pdf?dl=0 https://drive.google.com/file/d/1sRjXI1XJxosmN3jsmCJmzJxgfPn0NX7T/view?usp=sharing Camp & Hike: https://www.dropbox.com/s/cdq6bopx3zrlpsb/Camp%20and%20Hike.pdf?dl=0 https://drive.google.com/file/d/1QKidZV_7Qu3OWM301Lmv3YIwkvDF8Ygs/view?usp=sharing Passages https://www.dropbox.com/s/lnw6pc6biji410i/Passages.pdf?dl=0 https://drive.google.com/file/d/1eiDER3Xp9WVi9_1aW-wxE_rA65JbriwK/view?usp=sharing Pin Program https://www.dropbox.com/s/xy7n1nk9zjpl0ma/Pin%20Collection.pdf?dl=0 https://drive.google.com/file/d/1fFwsdDL8-Jjuhj5XcoimY0cLlRYSczDP/view?usp=sharing Please note the following: • Meetup organizers are not tour guides and are not park rangers. Expect the same risks and take the same precautions you would take if you were hiking alone. You are solely responsible for your own safety and well-being. • By signing up for and/or attending this Meetup event, you acknowledge, understand, accept, and agree that hiking and other outdoor activities can be dangerous and can cause serious bodily injury and possibly death. You further agree that you assume the risk of negligence by the organizers of this group and current and former members cannot be held responsible or liable in any way for the actions of any participant - including you - at any event. • All attendees participate at an event at their own risk and are solely responsible for any damage to their property, and/or any injury to themselves or their guests. • By signing up for and/or attending this Meetup event, you affirm that you understand this disclaimer, and that you knowingly and voluntarily agree not to bring any type of claim arising out of or related to this Meetup event against the organizers of this Meetup group. This ride is part of the preparation for the Rosarito a Ensenada ride in May. Anybody can come along as long as you bring a helmet. This ride takes advantage of the paved trail that goes along the 215. We'll start out at the beginning of the trail and ride out about 6 miles and then return. It has a slight climb to it, but riding back can be fun. This trail has very little exposure to traffic, which is why I like it. It's not the most exciting trail, but it's safe. Distance: ~ 25 miles Elevation Gain: ~ 1500 feet Time: ~ 3 hours I'm going to increase the distance and overall elevation gain in the coming weeks to prepare for the ride in Mexico. If you haven't ridden much, but want to go to Mexico, then you should start now. Some of the preparation will include Wetlands Park, Red Rock 13-mile loop, River Mountains Trail, and others that are paved. I try to stay off of the road as much as possible, but some rides will be sharing the road with cars. Anybody who wants to talk about the ride in Mexico is welcome to come out and we can discuss it. I've done the ride numerous times, so I'm comfortable with the details. Please note the following: • Meetup organizers are not tour guides and are not park rangers. Expect the same risks and take the same precautions you would take if you were hiking alone. You are solely responsible for your own safety and well-being. • By signing up for and/or attending this Meetup event, you acknowledge, understand, accept, and agree that hiking and other outdoor activities can be dangerous and can cause serious bodily injury and possibly death. The organizers of this group and current and former members cannot be held responsible or liable in any way for the actions of any participant - including you - at any event. • All attendees participate at an event at their own risk and are solely responsible for any damage to their property, and/or any injury to themselves or their guests. • By signing up for and/or attending this Meetup event, you affirm that you understand this disclaimer, and that you knowingly and voluntarily agree not to bring any type of claim arising out of or related to this Meetup event against the organizers of this Meetup group.